Whether it’s an instrument or concert tickets, buying gifts for musicians or music lovers can get expensive. 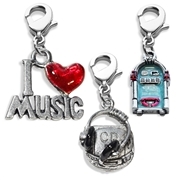 At Whimsical Gifts, we offer musical novelty gifts, like music-themed jewelry, charms and watches that are more wallet friendly. For the retro music fan, we have jukebox and CD player accessories. For the more classical listener, we have accessories featuring grand pianos, woodwinds, brass and orchestral instruments. 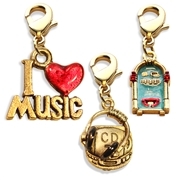 Finally, for the general music lover, we carry timeless musical note accessories. We make it easy for you to buy personalized music gifts that your friend, coworker, relative or significant other will find thoughtful and will want to cherish for years to come. Shop the best gifts for music lovers at Whimsical Gifts, and you can rest assured knowing that you’re gifting a quality, handmade item that will last. All of our products come in silver or gold-plated options, and every single charm is hand painted in meticulous detail. To top it all off, our jewelry and accessories are designed and made directly in the USA. Order a unique gift for the musician in your life today, and feel free to email us at customer.service@whimsicalgifts.com or call us at 877-324-0845 with any questions regarding our products!